What Would You Do If You Found $98,000 ? Are you ever in a situation where you know what the right thing is but it is difficult to actually make that decision? Do you feel that sometimes you may compromise your values because that moment caught you off guard? If you answered yes, Mazel Tov, you are a human being that has challenges that you have to work out. Every once in a while, we hear a story that we can only marvel that someone had the courage, strength, and character to do the “right thing” when it is so tempting to do otherwise and yet chose wisely. I am thinking of the recent story with a young rabbi in New Haven, Connecticut. Rabbi Noach Muroff had been searching the online classified listings for a desk for his office, finally finding one that met his needs several days before Rosh Hashana. Folding down the rear seats in his minivan, he went to pick up the desk, which he purchased from its original owner for $150. Instead, he unscrewed the top of the desk, and after doing so, noticed a white plastic shopping bag wedged in behind one of the desk’s side filing cabinets. 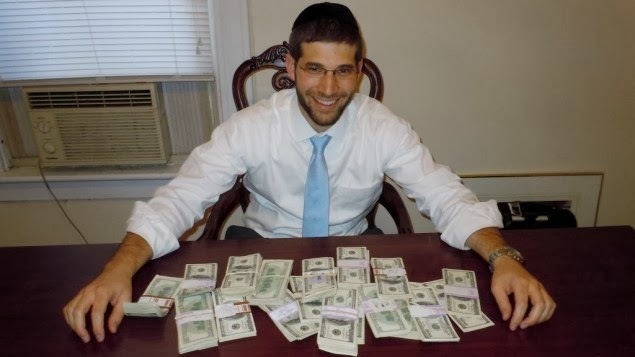 “We took out the bag and we could see that there was money inside,” said Rabbi Muroff. In fact, the bag was stuffed with neatly bundled stacks of one hundred dollar bills. There was never a question about what to do with the money. According to Rabbi Muroff, the original owner of the desk, a middle aged woman identified only as Patty, knew that she had hidden her nest egg in the desk but was unable to locate it when it fell behind the filing cabinet. Assuming the money had to be somewhere else in her house, the woman sold the desk, never once suspecting that it still contained her life’s savings. “If we hadn’t had to take the desk apart we never would have found it,” observed Rabbi Muroff. Rabbi Muroff, returned to the woman’s house the next day with his wife and four small children. “We took the kids along because we thought it was a good opportunity to teach them about being honest,” said Rabbi Muroff. In a world which we continue to shocked by senseless acts of violence and cruelty, it is refreshing to see someone not only perform a great mitzvah of returning a lost object but also inspiring others to be honest and ethical. I hope and pray that more can follow the path of this righteous man.